There are no desks in rows. When I arrived Thursday morning, the custodians, after attempting to clean the very stained carpet, had put them that way. One of my colleagues popped his head in and said, “What happened? This is NOT your room!” So he understands me. I am not interested in rows. 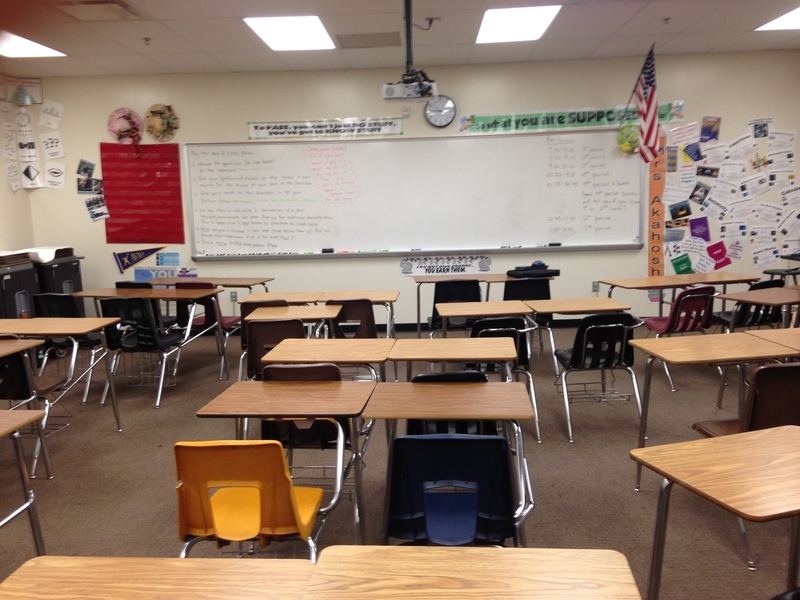 The desks are largely clustered in groups of 2, 3 or 4, and they are largely in a fan shape facing the board for the start of class. The object hanging from the ceiling is the back of the projector, and my laptop that controls it is (unseen) in the right corner. I have a wireless mouse, so I can run things from anywhere in the room. On the right side is a bulletin board that is currently covered by star paper. There are no actual windows in the building my classroom is in, so any attempt at nature counts as a window. I may change it to fluffy clouds with paper grass on the bottom so it matches summertime (maybe not the grass, or I’ll use brown for the dirt because of the drought), but bulletin board upkeep doesn’t really help my students on the first day of school. I have cleared much of the rest of that side of the room for vertical whiteboards, especially after reading blogs from (for example) @AlexOverwijk. This is the #1TMCthing I thought of doing, but since I have around 9000 things I want to try…I didn’t send this one out as a Tweet. I did the “cut a 4 x 8 showerboard (I’m not sure if that’s what it is actually called) into four 2 x 4 pieces” method. They are portable, and I used 3M brackets that are holding them off the ground. If it works as well as I expect during the first week, I’ll probably get more. I’ll take pictures of them when I can be back in my room…they told us we had to leave by 4 today, with alarms set and AC turned off…and no, it will be unavailable this weekend. There are a lot of cranky teachers. I’m ok with this. Since they are portable, the kiddos can prop them up on the tray on the main whiteboard in the front, or move them to their desks, or whatever they need. I also have 12″ x 18″ individual boards; there are 35-ish of these individual boards with a pre-drawn coordinate grid, and 15-ish pre-drawn circles. The vertical space whiteboards are completely blank. I have 4 sections of Math 1, 1 section of non-AP Statistics, and 1 section of AP Statistics. All of this white board activity is largely for the Math 1 freshmen so they can get up, walk around, and interact with each other. But they are available to everyone. These should help keep them (especially the freshmen) busy, and the pictures of any work done on them will be turned in to our Classroom. Typing math is unpleasant in Google Docs on an iPad; if they want to use the electronic whiteboard, ShowMe will be on the iPads. But the kiddos don’t get the iPads until at least Wednesday. Right behind where I took the above picture is a large table. OK, it is two skinny long tables put together.On Monday, it will be used for overflow seating (I have two sections that are currently listed as “over 40”). But the intention is to use this table space as a “consultation” area…if students have questions that their nearby peers can’t answer, the puzzled group can meet back there for clarification (by me? by other students? Not sure how this will work yet). I also have my document camera set up so I can take pictures of the kiddos so I can learn names easier, mostly because the pictures the District gives us are largely 2+ years old, and they will not be given to us until October (the earliest we ever got them). The actual plan for actual students…that’s Day 1. I will blog about it, plus the outcome of said plan, on Monday. I don’t know that anyone actually needs those plans right now, since most of the reactions to my “Hey…Teacher Day today!” tweets was “Already?” But I will post the first week of stuff as it happens, more or less. And no, the last two days were nowhere nearly as awesome as #TMC15. But I’m still feeling the Community.